The second Winteree was Dec. 11-13, 1987 at Pine Basin Lodge. Everyone was allowed to spend the two nights in the lodge. The flyer doesn’t say which troops came besides Troop 6. 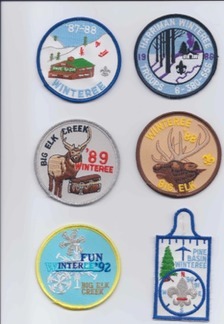 Dec. 1988 Winteree was held at Big Elk Creek Lodge, run by the YMCA. The fee was $9. No flyer for the 89 Winteree, but the 90-91 was held on Jan. 18. 1991 at Pine Basin Lodge. Troops 6, 310, 387 and 556 participated. Cost was $13. 1992 was held at Big Elk Creek again on January 17, 18 & 19. No flyers for 93 at Pine Basin, 94 at Big Elk, 95 at Pine Basin & 96 at Big Elk. The price went up at Big Elk and we stopped going there. 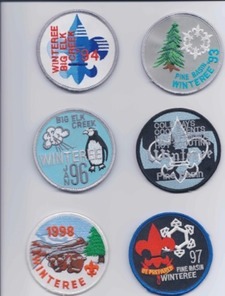 The 97 Winteree was at Pine Basin, Jan. 17-19, 1997. Troops 6, 310, 382 and 387 participated. The cost was $15 per person. No 98 newsletter, it was held at Pine Basin. 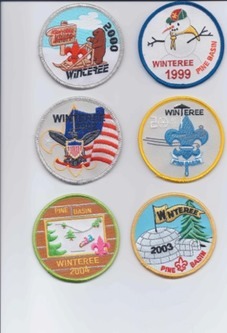 1999 Winteree was Jan. 15-17, at Pine Basin. Half were allowed to sleep in each night. That didn’t work well at all. The cost was still $15, and troops 6, 310, 382 and 387 participated. Jan.14-16, 2000 at Krupp, cost $15, Troops 6, 310, 382 & 387. Jan. 19-21, 2001 at Pine Basin, cost $15. Troops 6, 310, 382, 387, 128, 255 and 113. No more sleeping in the Lodge! Jan.11-13, 2002, at Krupp, cost $15. Troops 6, 310, 382, 387, 248, 123 and 255. Jan. 17-19, 2003 at Pine Basin, cost $15, Troops 6, 118, 255, 310, 382 & 387. Jan. 16-18, 2004 at Pine Basin, cost $15, about 100 expected. 6, 118, 255, 310, 382 & 387. Jan. 14-16, 2005 at Pine Basin, cost still $15. Troops 6, 118, 255, 310, 382 & 387. February 18-20, 2006 at Treasure Mountain Scout Camp. Troops 6, 310, 382 & 387. Only about 60 attended. Cost $20. February 2-4, 2007 at Pine Basin, Cost $20. Troops 6, 262, 310, 387, 395 and Crew 382. Patch designed by Matthew Krumweide of Troop 395. Feb. 1-3, 2008, scheduled for Pine Basin, but the roads were closed, so we made a quick change to Krupp. Cost $20, Same troops as 2007. In addition to patches, the Scouts were given cups to use and keep. The Shaws of Troop 387 designed the patch. Jan. 30-Feb. 1, 2009. Cost $20. Troops 6, 262, 310, 387, 395 and Crew 382, plus LDS troops from the Eagle Rock District for Friday and Saturday. 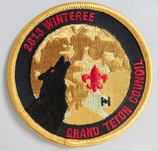 Matt Solle of Troop 6 designed the patch. 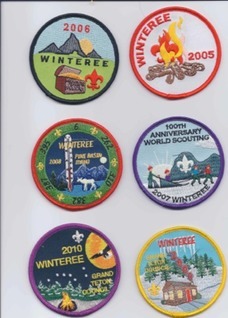 Jan. 29-31, 2010, Centennial Winteree, cost $20, $5 for LDS units. Held at Pine Basin. Troops 6, 310, 387, 395, plus units from Each Eagle Rock District Zone. Over 200 attended all or part of the event. January 28-30, 2011 at West Piney Lodge, Eagle Rock District Winteree. 285 people attended. Patch designed by Russ Burt of Troop 2. Troop 387 won the overall award. January 27-29, 2012 at West Piney Lodge, 260 youth and 100 adults attended. 37 units were represented. Troop 387 won again. The patch was designed by Seth Stewart of Troop 6. The price was the same as in 2010. January 25-27, 2013 at West Piney Lodge, 275 people total attended. 35 units attended and Troop 387 won for the 3rd year. Cheryl designed the patch and the price didn't change.